Our business is the logistical and physical distribution of freight in the Continental U.S., Mexico and Canada by truck, rail and air. Our full service international freight department understands the complexity of freight movements through international ports as have long term experience with Far Eastern freight forwarders and customs brokers. So your freight is not delayed, we carefully review all the paperwork to spot problems ahead of time with faxed copies of steamship notification, delivery orders, ocean and inland bills of lading, packing lists and customs forms. 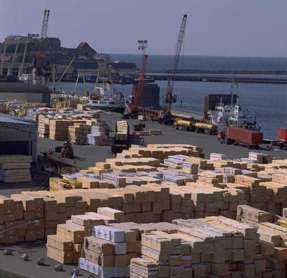 And because of our familiarity with the different steamship lines, CFS stations and container yards, we know all the particulars and requirements that are necessary to ensure that all documents are accurately filled out with the proper information: correct origin, berth, bill of lading numbers, weight, piece count, addresses, etc. so your freight is not delayed. We will contact the customs broker and ensure that delivery orders, OBL and charges, and customs documents are in order and ready to present for pickup of your freight. By pre-booking equipment prior to cargo arrival and our staff checking regularly for availability of your freight at the port, we can secure your freight promptly and move it on its way.We will make sure that all marks and exceptions are noted and that no shortages or overages occur. We understand how errors can cost you time and money when freight cannot be moved our job is to get it right the first time! We have a network of over 500 carriers, all of whom must pass our stringent requirements concerning service levels. equipment availability and specifications and cargo and liability insurance, We'll save you time and legwork by providing you with the best possible rates and we'll give you piece of mind because our carriers have satellite tracking, enabling us to always know where your load is on the shipping lane. Our dispatchers use custom software designed especially for our needs and it enables us to trace a shipment for you anytime you need to know; and if you have internet capabilities, you can trace from your company's computers - we'll provide you with our "pro" number so you can always know where your shipment is. Our carrier base has over 5,000 trailers available for loading in the Los Angeles and Orange County Metro area on any given week, and we can dispatch equipment to your loading facility within 3 hours. The current interchange agreements with our carriers allows us to also maintain a trailer pool at our terminal, giving us the flexibility to spot empty trailers with our local cartage company in the event that our carrier base cannot react within the 3 hour window. You will always be assured of having your load covered quickly and on its way to its destination.